These coupons are all about the same. 10% off on average seems just written up many ways. Curious what holiday specials will be like. They sent out October specials that were great. Except I didn't have any money to make use of them =/ I imagine closer to xmas we'll see another wave of those sent out to VIP members. coupon codes for VIP silver member? any general 10% off coupons right now? sorry nothing extra for silver members. check back on friday there may be. Any general 10% off coupons for Dec? Save $10.00off orders of $100.00 or more! Save $20.00off orders of $200.00 or more! Save $5.00off orders of $50.00 or more! Last edited by Matt Trimmings; 12-07-2018 at 07:18 AM. That's not an AMain issue. Quite a few states have started taxing Internet based purchases. It is however AMain's responsibility to follow the laws of the states where purchases are made from/shipped too. big james and I_NeedBigDrink like this. Any special coupons for VIP Platinum members? Sorry just the monthly codes right now. Save $15.00off orders of $150.00 or more! This coupon is worth $15.00 off your total order. Some exclusions apply, including gift vouchers and manufacturer restrictions.To claim your instant savings. Save $35.00off orders of $300.00 or more! This coupon is worth $35.00 off your total order. Some exclusions apply, including gift vouchers and manufacturer restrictions.To claim your instant savings. 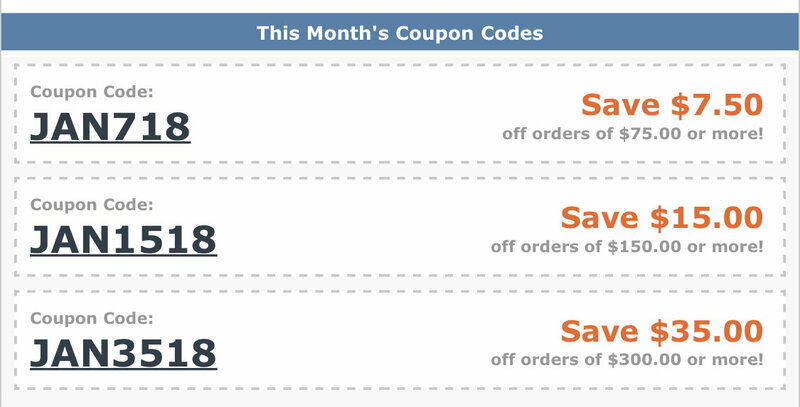 Save $7.50off orders of $75.00 or more! This coupon is worth $7.50 off your total order. Some exclusions apply, including gift vouchers and manufacturer restrictions.To claim your instant savings. off orders of $100.00 or more! This coupon is worth $10.00 off your total order. Some exclusions apply, including gift vouchers and manufacturer restrictions. off orders of $300.00 or more! This coupon is worth $35.00 off your total order. Some exclusions apply, including gift vouchers and manufacturer restrictions. off orders of $50.00 or more! This coupon is worth $5.00 off your total order. Some exclusions apply, including gift vouchers and manufacturer restrictions. off orders of $99.00 or more! off orders of $129.00 or more! This coupon is worth $20.00 off your total order. Some exclusions apply, including gift vouchers and manufacturer restrictions.